Fred Gibbs, a native of Niagara Falls, was a multi- talented athlete. He was an outstanding natural in basketball, baseball, bowling, tennis, golf, and track and field. Fred's athletic career began at Stamford High School where he excelled in several sports. He won the City Tennis Championship in 1937 and also went on to place in the COSSA Track and Field in the pole vaulting event in 1936. 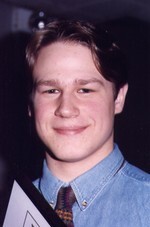 During the summer months, Fred participated as a member of many Niagara Falls baseball championship teams from the midget to the senior level which always went on to compete at the provincial level. At the senior level, Fred played second base for Niagara Falls Houck's O.B.A. Champions, in 1946. Fred's athletic career was interrupted in 1939, by a five year length of service in the R.C.A.F. Before long he became a member of the R.C.A.F. Basketball team in Canada and overseas. He participated in several tournaments in England in the years from 1941-1943. Fred was a member of the Hamco Basketball Team, which became Dominion Champions. 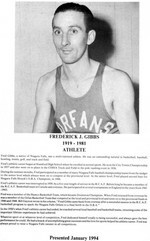 When Fred returned from overseas he was a member of the Orfan Basketball Team that competed at the local and provincial level and went on to the provincial finals in 1946 and 1948. Bill Gaynon wrote in his column, "Fred Gibbs came back from overseas after a successful session in the R.C.A.F. basketball program to spark the Niagara Falls Orfans to a final berth in the O.B.A." In the 1950's when Fred's athletic career had ended, he coached several local baseball and basketball teams, returning some of the important lifetime experiences he had achieved. Whatever sport or at whatever level of competition, Fred dedicated himself totally to being successful, and always gave the best performance he could. He had a knack of accomplishing great successes and his love for sports helped his athletic career. Fred was always proud to wear a Niagara Falls sweater in all competitions.